Hey Guys,Now You Can Pin a Posts On Facebook Groups and Pages. 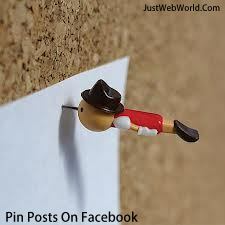 It is Simple Like Attach a Pin On a Paper Same in Facebook You Can Attach a Pin On a Facebook Posts. By Using This Your Post Visible On Facebook Groups and Pages till you not unpin that post. By Using The Pin Post Your Status have on a Top Of The Group. > Click The Mouse On The Right Side Of The Post Where You See The Drop Down Menu. > You Will See On a Drop Down Menu Pin Post If You are a Admin Of The Group. Now Just Click On The Pin Post and Your Post Will Be Pinned. > Use Same Formula and because of the Pin Post You see The Unpin Post Just Click On That.